Fifteen seconds. That was all it took for Ollie Sleightholme to open his Premiership try account for Saints. On a special November day at Franklin's Gardens, Sleightholme's moment was perhaps the most special of them all. 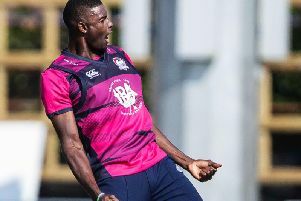 It looked like nothing could upstage Fraser Dingwall's first Premiership score, with the centre finishing with a flourish after a brilliant break from Taqele Naiyaravoro. But Sleightholme's try was just as eye-catching and the rapid nature of it meant it was a real highlight in the 36-17 win against Wasps. No sooner had he come on than he had picked the ball up from Luther Burrell and skated down the right, diving in for a sublime score. Sleightholme admits he was nervous when he entered the field, but his innate finishing ability took over and he put the icing on the cake of a comprehensive league success. And just seven days later, Sleightholme did it again, scoring at Sale Sharks to make it two tries in as many Premiership appearances. It has been a stunning start to life in England's top tier for the 18-year-old, who has learned his trade in Saints' Academy. And Sleightholme said: "It's been really good. "I'm enjoying getting some minutes under my belt in the first team. "I've been put in because of injuries so that's always difficult to be happy about but you've got to take your opportunities when you're given them. "It's been really good to get the tries I have. It's kind of right place at the right time, but it's enjoyable. "Both tries have been earned for me in a way, both really good team tries, but it's nice to get your name on the board and get the points for the team when they need it." Though Sleightholme modestly plays it down, the score against Wasps was just as much about him as it was the team. And when asked to recall it, he said: "It was almost surreal for me and I can't remember too much about it but it was obviously good. "I was very nervous when when I was coming on because the Premiership is a lot different to anything else with the noise of the crowd. "We were all pretty pumped for that Wasps game and I came on in a good situation because we were up by quite a bit, so that was nice. "Every time you're on the bench you've got to be ready to come on at any point during the 80 minutes. You've got to stay aware." Sleightholme has shown he is not just the player at the end of the line, he has already shown real defensive ability to ally with his attacking qualities. He produced key turnovers in both of his Premiership appearances, stopping Wasps and Sale in their tracks. And that has shown that even though the Premiership is a different beast to what he has dealt with before, he is more than capable of handling it. "It feels a lot different playing in the Premiership," Sleightholme said. It's a lot more physical and a lot higher intensity. "But you've got to think of it as another game of rugby. "I'm chuffed with what's going on so far so I've got to keep my head down." And that is exactly what Sleightholme's dad, Jon, who is a former Saints and England wing, has been saying to his son. "He lets me get on with it most of the time," Sleightholme junior said. "He just tells me to keep my head down and just get on with keep doing the good stuff. "He's always got an opinion, some wise words as he would say, to try to help me so that's nice."